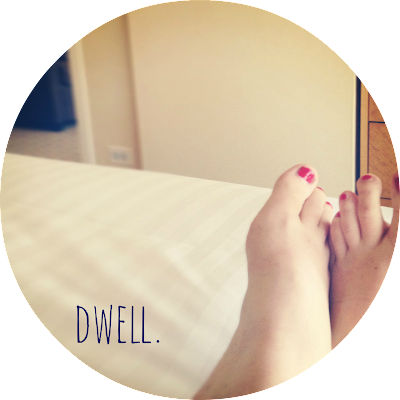 I had been contemplating a blog name change for a while now. I was itching for something new and fresh. A name that better reflected the content of my space. I had been thinking about it for a while, but then, literally a few days ago, it just clicked. I knew I wanted to use my first and middle name as my domain, but I also wanted a tagline that communicated the story of this blog. And, in one moment, it came to me: dwell. To dwell is to think about something. To ponder it. Well, I do a whole lot of dwelling (or rambling?) around here. Sometimes it's cheesy. Sometimes it's not. To dwell is to live somewhere. To be. Well, I write a lot about where we live, how we make it a home, and the stories that happen within these walls. Even though the content of my blog will probably not shift much (like anything, it will continue to grow and mature), but I feel like my name finally reflects more of my vision. I want this to be a place of learning. Of learning to dwell. Popping in from the Influence Network! I Love your new name and tagline. It's really peaceful and home-y. When I read your last paragraph, I kept thinking, "yes, yes YES!". looking forward to reading more!